Van Halen kicked off 2015 in February with confirmation of a late March release of “Tokyo Dome Live In Concert”, their first-ever live album with original frontman David Lee Roth. In early March, Eddie Van Halen took part in an interview at The Smithsonian's National Museum of American History in Washington to help launch the institution’s new 3-year initiative “What It Means To Be American”, a project aimed at engaging leading thinkers, public figures and Americans from all walks of life to explore how the United States became the nation it is today. As part of The Smithsonian session, the guitarist revealed and raved that son and VH/Tremonti bassist Wolfgang was recording his debut solo album. The day “Tokyo Dome” hit stores alongside 2015 remasters of their 1978 self-titled debut and their 6th album “1984”, Van Halen launched the live package with a performance on ABC’TV’s Jimmy Kimmel Live, delivering a classic 8-song set after Roth cut his nose for 14 stitches while twirling a baton during the opening number. A few days later the band promoted “Tokyo Dome” by performing a pair of hits on The Ellen DeGeneres Show. Former VH frontman Sammy Hagar wasted no time in shooting the live album down less than a week after its release while it debuted at No. 20 on the US Billboard 200 album chart with opening sales of 31,000 copies. On the event’s red carpet, Roth confirmed that the band had no plans to perform material from the Hagar years when they headed out on their summer North American tour, while the Red Rocker was quick to issue a reply of his own. Van Halen delivered a mix rarities and classics – including a pair of live debuts – at the launch of their summer tour in Seattle on July 5. Mixed reviews of the trek followed all summer, while Roth paid tribute in New Jersey to NFL legend and broadcaster Frank Gifford following his passing in August. The tour wrapped in early October with a pair of dates at the Hollywood Bowl. In November, Eddie shared a list of his favorite guitar riffs as part of Billboard’s “Greatest Of All Time” series, while a reunion of Roth’s band from 1986’s “Eat ‘Em And Smile” project made headlines when they were set to play a free show in Los Angeles that was ultimately shut down by the fire marshall for overcrowding of the venue and the surrounding streets. In early December, singer Mitch Malloy released “It’s The Right Time”, a demo he recorded during his 1996 audition for Van Halen that saw him hired to replace Hagar but back out after Roth appeared with the group at the 1996 MTV Music Video Awards. Extreme frontman Gary Cherone was then brought in for the “Van Halen III” album and tour. 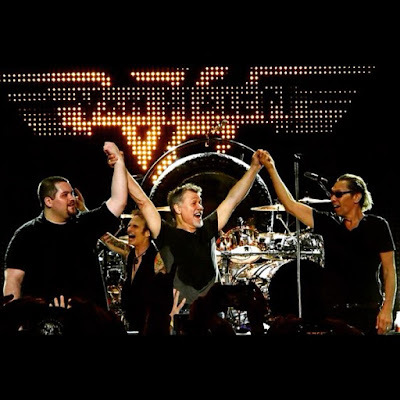 No Van Halen schedule for 2016 has been revealed, but it is expected that Wolfgang’s solo debut will be released while Roth may be making plans for another shot at the “Eat ‘Em And Smile” reunion show that was shut down last month.